Rush hour traffic along Crowchild Trail was disrupted this afternoon when a naked man driving a Canada Post truck struck several vehicles. Rush hour traffic along Crowchild Trail S.W. was disrupted Wednesday afternoon when a naked man driving a Canada Post truck hit several vehicles before running into a convenience store. 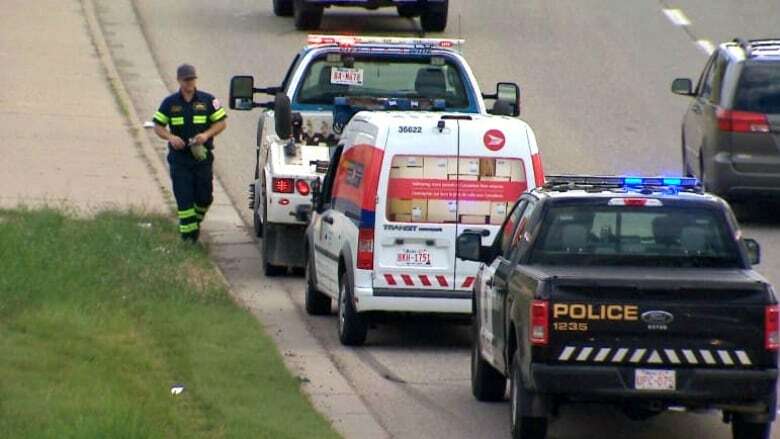 According to Calgary police, the call came in shortly before 5 p.m. when several people reported the Canada Post vehicle driving erratically along Crowchild Trail south of Glenmore Trail. The vehicle allegedly struck up to eight vehicles before the driver exited the Canada Post truck and went into a nearby convenience store. The driver, described as a white male in his mid-20s, was not wearing any clothing. The man was taken into custody soon after exiting the convenience store and EMS was called to assess his condition. It's not known whether the driver is an employee of Canada Post or whether the vehicle was stolen. Despite the traffic snarls caused by the crash, the disrobed disturbance seemed to bring some levity to people on social media Wednesday. And the riffs were particularly rich on Reddit. "Naked mail delivery. Beat that Amazon Prime," wrote one user under the name of TheMooseofMooseJaw on the site. "Now that's a special delivery. Maybe it's the new uniform for Canada Post drivers?" posted another user under the name of blanchae.